"We were entirely ready to have God remove all these defects of character." After taking the Fifth Step, many of us spend some time considering "the exact nature of our wrongs" and the part they'd played in making us who we were. What would our lives be like without, say, our arrogance? With arrogance gone, we would be one step closer to being restored to our proper place among others. We would become capable of appreciating their company and their wisdom and their challenges as their equals. Our support and guidance would come, if we chose, from the care offered us by our Higher Power; "low self-esteem" would cease to be an issue. One by one, we examined our character defects this way, and found them all defective - after all, that's why they're called defects. And were we entirely ready to have God remove all of them? Yes. Just for today: I shall thoroughly consider all my defects of character to discover whether I am ready to have the God of my understanding remove them. Kuala Kangsar all set for the royal wedding. So, here I am performing my solemn duty as an ordinary and loyal subject standing in front the main entrance of The Royal Palace of the Sultan of Perak Darul Ridzuan, "Istana Iskandariah". If you like to see my Recovery Friends having their kicks every Thursday, click hAAlf-nAAked Thursday or on the above pic of me above. You gonna have so much fun. I'm sure you gonna comes back there every Thursday. What are you waiting for, head over there now? KUALA KANGSAR: About 15,000 people are expected converge to this town on Saturday to celebrate the royal wedding of Raja Muda of Perak Raja Dr Nazrin Shah to Zara Salim Davidson. Kuala Kangsar OCPD Supt Zakaria Pagan urged visitors to heed directional signages, which will be put up by the police to avoid congesting the town. Supt Zakaria said with the royal wedding reception at Istana Iskandariah in Bukit Chandan and jamuan rakyat (people’s feast) at the Arena Square here from 8.30pm onwards, traffic along several roads had to be streamlined. “This is to enable invited guests and the public to attend both events without difficulties,” Supt Zakaria said. In Seri Iskandar, Mentri Besar Datuk Seri Mohamad Tajol Rosli Ghazali said political parties in the state would hold their own charity programmes to celebrate the royal wedding. He said on his part, he would give a lunch treat to children of an orphanage in Pengkalan Hulu. “A fireworks display, sponsored by the MCA and the Chinese community, is among the events lined up for the celebration,” he said. Tajol Rosli said the prince had initially requested the celebrations to be on a small scale but relented after he was informed that the money would not come from the state’s coffers. Meanwhile, Bernama reports that heads of state and federal departments as well as statutory bodies in Perak, were barred from buying advertisement space in newspapers in conjunction with the wedding. Raja Nazrin, 50, will marry Zara, a grandniece of first Prime Minister Tunku Abdul Rahman, in a simple ceremony at Istana Iskandariah in Kuala Kangsar today. This will be followed by a special proclamation ceremony tomorrow in which Zara would be bestowed the official title of Raja Puan Besar of Perak. Copied and pasted from The Star Thursday May 17, 2007. 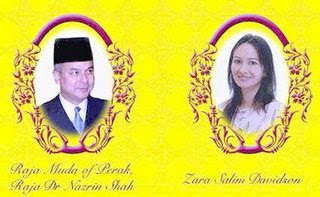 KUALA LUMPUR: The Raja Muda of Perak, Raja Dr Nazrin Shah, has politely declined a state allocation for his wedding with Zara Salim Davidson on Thursday, Mentri Besar Datuk Seri Tajol Rosli Ghazali said yesterday. “As the chief executive of the state government, I really appreciate the concern of the Raja Muda of Perak not to permit the state government to spend money for his marriage,” he said. Tajol Rosli said Raja Nazrin conveyed his wishes when he had an audience with him recently. 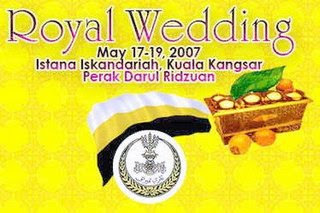 “During the audience, Raja Nazrin politely thanked the state government for allocating funds for the royal wedding. “Instead, he advised the state government to spend the money for development projects to meet the needs of the people,” he said in a statement issued to Bernama yesterday. Tajol Rosli also said Raja Nazrin had told him that he would pay for all expenses incurred for his wedding. “Hence, if there are expenditures involving the state coffers, they are to repair and upgrade infrastructures that benefit the people in the long term,” he said. Raja Nazrin also said expenses for the feast for the common folk would also be borne by him. Some 5,000 ordinary folk, including orphans, would be feted in conjunction with the May 19 wedding reception. They include local Village and Security Development Committee (JKKK) members, village heads and grassroots politicians. The orphans are from Rumah Anak Yatim Kati, Rumah Anak Yatim Sultan Abdul Aziz and Rumah Anak Yatim Sungai Siput and students from schools in and around the royal town of Kuala Kangsar. Tajol Rosli also said the Raja Muda wanted a simple royal wedding conducted on a moderate scale. He said Raja Nazrin also advised companies and individuals against competing to buy advertisement space in newspapers on the occasion of his wedding. “Instead, he advised them that he would be happier if the funds for the advertisements are channelled for charity, especially donating to places of worship, welfare bodies, old folks homes, orphanages and schools in Perak,” Tajol Rosli said. Copied and pasted from The Star Sunday May 13, 2007. I got tons of defects Noor, and I still have, but I guess I am much more aware of them. Being aware of them is what I think God in his infinate wisdom does and we still may act them out but in a knowing way until we do it no longer, I suppose this can take a lifetime. I am off to Wales on the Spring Bank week, 26th June-2nd June. Blimey you must be really important to go to a royal wedding, here in the UK I am just a common person on a despatch desk in a brick company, but I gotta admit I wouldnt want to be famous. Wow, thanks for giving us another piece of your world, Noor Azman -- fascinating. It looks like the city is going to be beautiful at night. As for Step Six. Thanks for the post cause that's right where I am 6-7 and onward. Hi Noor, yes its me again, have you seen "Lord Of The Rings" then which was what my mountain story was based on, it went down quite well with those who have seen the film, I got a DVD as well, I could post it to you if I knew where to post it. Anyway I feel good today cos its weekend again and just one more week and its the hols horray! A royal wedding sounds like an event. The city looks beautiful. Thanks for exposing us to your culture and World. Pretty amazing to learn how this World is filled with many people living out life each day. Hey AZman. Thanks for dropping by. Royal Wedding coming uphuh. Must be an exciting time over there. Hi Noor. That was a really cool read about the Royal wedding. Thank you for sharing that! Is the decision to pay for his own wedding making Raja Muda more popular? His wife to be looks like a lovely woman. Well educated too, it seems. I hope you will share photos of the festivities, if you can. Best wishes & have fun! Noor, I couldnt find anywhere to post a comment on your newsest post with the fireworks on, so I had to do it here. I hope u not angry with me for sending the email about voting for me, I was just a bit bored last night, anyway I voted for you and left you a comment. On about Royal Wedding well over here in England the Royal Family cost Billions and Billions more are wasted by poletitions, I loved the fireworks though.